Collagen plays a key role in the support structure and density of the skin. Over time this structure changes, leaving the skin feeling less firm and less dense. Facial features become more hollow (cheeks, temples and neck), less well defined and facial expressions become more drawn. Your skin and its support structure require optimal moisture to maintain its shape and elasticity. Target hollow areas and wrinkles. Plump up and smooth the surface of the skin. The active Pro Collagen has a skin surface refining action. Infusing the skin with collagen, it helps to define the skin's surface and make it look smoother. 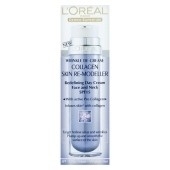 Formulated with SPF 15 it helps protect against the signs of premature skin ageing. Collagen Skin Re-Modeller leaves the skin feeling instantly supple and velvet-soft, making it even more pleasurable to use. Aqua / Water, Ethylhexyl Methoxycinnamate, Glycerin, Cyclohexasiloxane, Alcohol Denat., HDI / Trimethylol Hexyllactone Crosspolymer, Dipropylene Glycol, Phenylbenzimidazole Sulfonic Acid, Cyclopentasiloxane, Ammonium Polyacryloyldimethyl Taurate, Triethanolamine, Tocopheryl Acetate, Boswelia Serrata / Boswellia Serrata Extract, Manganese Gluconate, Medicago Sativa / Alfalfa Extract, Atelocollagen, Polysilicone-8, Capryl Glycol / Caprylyl Glycol, Acrylates / C10-30 Alkyl Acrylate Crosspolmer, Dimethiconol, Pentaerythrityl Tetraisostearate, Sodium Hydroxide, Biosaccharide Gum-1, Silica Dimethyl Silylate, Sodium Chondroitin Sulfate, Disodium EDTA, Imidazolidinyl Urea, Phenoxyethanol, Methylparaben, Parfum / Fragrance, Butylphenyl Methylpropional, Alpha-Isomethyl Ionone, Hydroxyisohexyl 3-Cyclohexene Carbooxaldehyde, Benzyl Salicylate, Linalool, Hexyl Cinnamal, Citronellol, (F.I.L. B26856/1).